“Since last year I’m attending adult education so I can help children with reading and writing and encourage other mothers”. 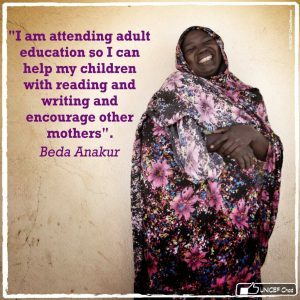 Meet everyday hero Beda Anakur, Coordinator of a UNICEF-supported mother-teacher association in Mongo, Chad. Her hard work is helping improve education for all children in her community, especially the vulnerable and those previously left behind. Thanks to UNICEF Chad for sharing.